Stir in milk & oil all at once & combine with fork. Shape into a 5-inch disc and place between 2 sheets of floured wax paper. Roll into a 12-inch circle. Place into pie pan and trim or flute edges. Prick the crust with a fork 15 times and cover the rim with a pie ring or foil to prevent burnt edges. Bake for 15 minutes or until it's lightly browned. When it's done, set on a wire rack to cool & reduce oven temperature to 350° F.
While the crust bakes, start the filling. Zest the lemons and make lemon juice. Set aside. Combine sugar and cornstarch in a saucepan. Place water, juice, and yolks in a bowl and whisk together, mixing well. Slowly whisk juice mixture into sugar mixture. Bring to a boil and cook for 2 minutes, stirring often. Turn off burner and stir in butter and lemon zest. Cover to keep filling hot. Pour hot lemon filling into cooled or slightly warm crust. Top with meringue, making sure edges are completely sealed. Bake at 350° F (without pie ring) for 6-8 minutes. 50 Comments on "Lemon Meringue Pie"
I don’t think it would survive freezing very well but you might find more info with an internet search. 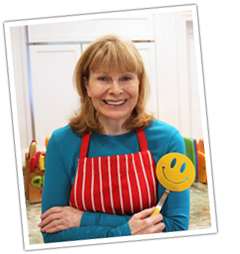 Hi jenny I love your recipes! Shall I continue to finish the rest of the reciepes or it it ruined and I should just throw the crust without continuing ??? I little shrinkage is not unusual and the bubbles might be from not pricking enough holes in it with a fork. If this happens again, as long as it’s cooked through and golden, I would just proceed. It won’t affect the taste. I just made your pie and I’m waiting for it to cool but it still has two hours left so could I just put it in the fridge so it can cool faster and so I can eat it faster. It needs to cool at room temperature. What is a pie ring? you can get a pie ring at http://www.goldaskitchen.com, it comes in a 9 and a 10 inch. I bought a 9 and wish I had gotten a 10. Maybe another time. It needs to be completely cooled before serving. On a wire rack it should take about 3 hours. Yes, but it won’t be my recipe so I hope you’re not disappointed. It also won’t be as healthy as mine considering the ingredients in store-bought crusts. About how much is the zest of two large lemons? I’m going to do a deep dish version,I assume I will need to double the filling ?and what adjustments do i need to make for the crust,to make sure I have enough dough? instead of Meringue for a topping,I’m going to go with whipped cream ,so do I need to use a pie ring in the first bake ? and should i bake it the 2nd time,obviously with out the whipped cream? do i need to keep the pie refrigerated after it is done baking and cooling off ? The pan I use for this recipe IS a deep dish pan so you would not need to make any changes. I don’t think you will need the pie ring at all but I would look at it half way through baking to make sure it doesn’t brown too much. You can always add the ring towards the end. (you will not need a 2nd baking) And definitely keep the pie refrigerated when you use cream. Good luck with the pie. u should put this receipe on ur utube channel. I absolutely love u on utube. I have changed my way of baking because of ur low fat & low calorie receipes. I can’t wait for u to post more!! Can I replace the lemon to durian? Will it be any different for the ingredients? Durian is a Asian fruit, that have very strong sense.. If I use 8 inches pie pan isn’t okay? I made this pie, the meringue won’t stick to the filling and the filling not stick to the crust when I eat, isn’t like that when you eat? A pie pan that measures 8 inches across the bottom is the size most commonly used in pie recipes, including all of mine. I can’t comment on durian since I am not familiar with it. Can I use corn flour instead of corn starch? Will it be any different from that? I has to be corn starch for this recipe. What may be confusing is that in some countries, corn starch is called corn flour. The corn starch that I use has as very fine texture, even finer than powdered sugar, and that is the only thing to use in this recipe. How do I know the pie is fully baked? It put on the middle rack or bottom? If you refer to the pie crust, it is ready when it’s lightly browned and if it feels firm when you press down in the middle. It’s better to over-bake a pie crust than under bake because then it can get soggy. If you mean after the meringue is on top, well the crust and filling are already cooked and all you have to do is toast the meringue a little. Since your oven is small, keep an eye on it every couple of minutes so it doesn’t burn and if the meringue is too close to the top of the oven, I would then use a lower rack. May I know u are using how many inch pan? Will it be too sweet of this recipe? Can I purchase the lemon zester from you, if can how much will you charge for other country? I mean this lemon meringue pie, will it be very sweet? None of my desserts are very sweet so I would say no. I try to bake with as little sugar as possible but it still has to taste good. 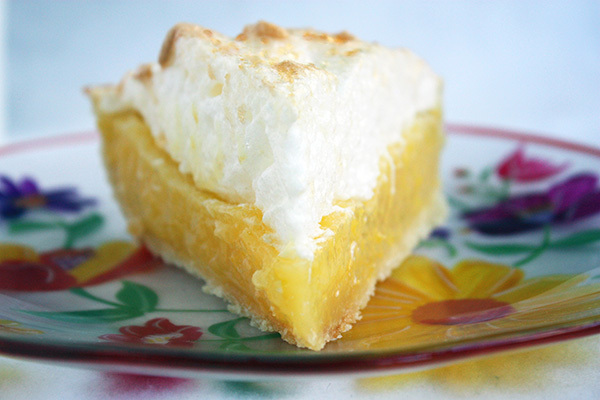 This pie has more sugar than most of my desserts and that’s because lemon juice is so tart. I hope you like it. I baked this pie and people….it’s the healthiest and best I’ve ever had ! So easy to make ! YUM. Sophia, a lemon meringue pie is a pretty big undertaking for a 10-year old like yourself so I appreciate that you are so passionate about cooking. If your meringue was “moist & jellied together” you need to make sure that: 1) the egg whites are at room temperature and are free of any bit of fat. 2) you beat them for a long time, at least 5 minutes and without cream of tartar, even longer until they are very stiff. And be sure you add the sugar very slowly. You may have added too much lemon juice. I have never used lemon juice but a touch of acid helps the egg whites stabilize, like 1/8 teaspoon. 3) you cannot rush meringue so take your time and it’s not ready until you lift the beaters and the egg whites are very, very stiff. Now for your lemon curd: If it was too thick you may have used more cornstarch than needed. Be sure to measure it with a “stacking” style cup and level it off with a spatula and as with the meringue, follow the steps exactly and take your time. Do every step slowly and be sure to slowly add the juice mixture to the sugar mixture, stirring constantly. In fact, keep stirring it the whole time it cooks. I assume you used fresh lemon juice. So that’s my advice. I know that if you follow my recipe exactly, no substitutions, no changes, this pie will turn out. I did not make a video but it might help for you to watch some videos on how to make lemon meringue pie. I hope this helps and keep up your cooking and baking. I’ve been cooking all my life and some things don’t turn out for me either, but I always go back and try again. I don’t know of a good substitute but the purpose for the cream of tartar is to help stabilize the meringue. You can make meringue without it, but make sure you beat it really, really well until it’s very stiff. Hi, so I made it and my family said it was my first time but the filling and meringue did not turn out right. :-( What did I do wrong? I need more information to help figure it out. Please give me some details about how it did turn out and what changes or substitutions, if any, you might have made. What equipment/mixer did you use and what baking pan? What kind of milk and oil did you use? With some more detail, I can probably figure it out. The meringue was moist and jelled together. The filling was too thick. This was what was wrong with it. I used a stand mixer for meringue and my grandmother said I could use lemon juice for meringue so I did that. Hope it helps. What do you mean by “pie ring ” in the sentence: cover the rim with a pie ring or foil ? And why do you need the foil? And do you cook the filling on med heat? I have not made a video for my lemon meringue pie. If I do one in the future, it will be added here.